Nifty opened big and rallied sharply on the optimism of the European leaders will take action of the Euro problem and our Prime Minister also taking charge of Finance Ministry. The index saw one of its biggest gains after 4 dull days of trading to close at 5278.90, a gain of 129.75 points and weekly gain of 132.85 points or 2.58%. The Option Table saw huge makeover with 5200PE adding a whopping 22 lacs and 5400CE adding 18.5 lacs, with the range shifting to 5200-5400 for the coming week. Nifty saw huge addition 35.5 lacs OI and now today’s low becomes very important. Call option 54000-5700 added 47.5 lacs huge amount of OI, with huge liquidation seen at 5200 and lower levels. Put Option 5500-4800 added 71.8 lacs huge amount of OI, with small profit booking seen at 4700 level. 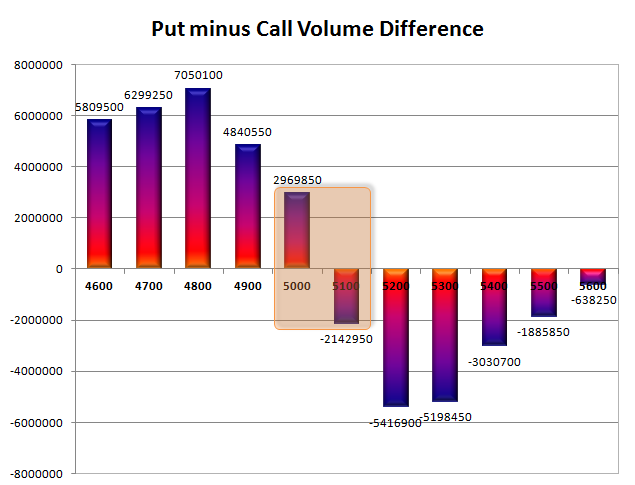 Highest accumulation on Call option 5400 at 46.1 lacs & 5300 at 44.2 lacs whereas Put option 5000 at 62.4 lacs & 5100 at 41.6 lacs. Nifty Open Interest is at 2,16,38,200 up by 35,55,150 with huge-huge increase in price, most probably huge long build-up. 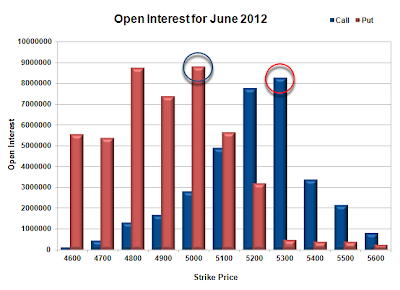 Bank Nifty Open Interest is at 25,06,475 up by 15,150 with huge increase in price, most probably some long build-up. FII’s bought huge 32.64 lacs Futures, most probably long build-up, their OI also increased by 26.9 lacs, and their average price per contract comes to around 5185. FII’s future open contract as on date is 4.86 lacs. 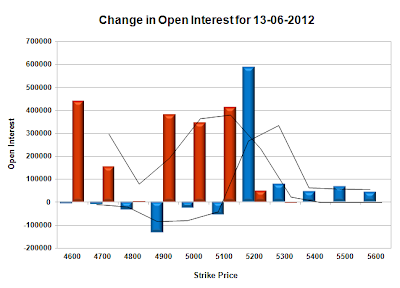 PCR Open Interest (Volume) has started gaining momentum on the upside and now at 1.526. Support has jumped up to 5200, with huge addition of 22.2 lacs, below that at 5000 with highest OI of 62.4 lacs. Resistance is right now placed at 5300 but look vulnerable, with OI of 44.2 lacs and above that at 5400 with highest OI of 46.1 lacs. 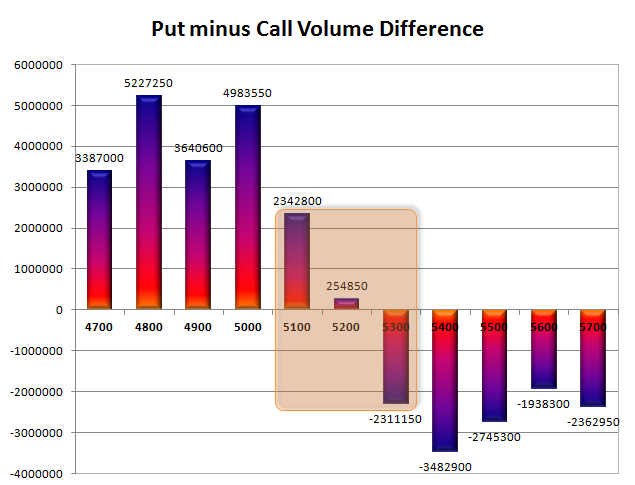 Range as per Option Table is 5195 -5310 and as per VIX is 5216 - 5321 with 5250 as the Pivot. Nifty today had a very dull expiry within a range of just 34 points with first half range of approx 10 points. The index ultimately closed the day at 5149.15, a small gain of 7.25 points. The Option Table at the start of the series look like developing a range of 5000-5300. July series saw addition of 1.2 Cr Open Interest within the range of 5095-5195. Call option 52000-5600 added 42.6 lacs huge amount of OI, with small also at lower levels. Put Option 5100-4600 added 63.6 lacs huge amount of OI, with small addition at higher levels. Highest accumulation on Call option 5300 at 44.8 lacs & 5200 at 38.5 lacs whereas Put option 5000 at 57.8 lacs & 4900 at 38.7 lacs. Nifty Open Interest is at 1,80,83,050 up by 48,86,450 with small increase in price, 100% rollover with huge long build-up. Bank Nifty Open Interest is at 24,91,325 up by 9,51,850 with no change in price, 100% rollover with huge some long/short build-up. FII’s bought small 0.56 lacs Futures, most probably long build-up, their OI decreased by 1.23 Crore, and their average price per contract comes to around 5080. FII’s future open contract as on date is 4.32 lacs. 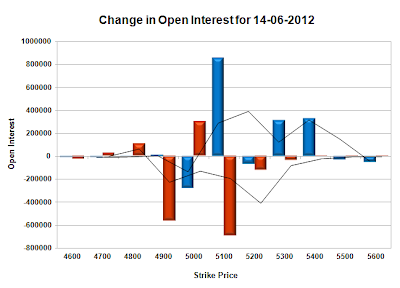 PCR Open Interest (Volume) at the start of the series is at healthy 1.477. Support for the day at 5100, with huge addition of 8.75 lacs, below that at 5000 with highest OI of 57.8 lacs. 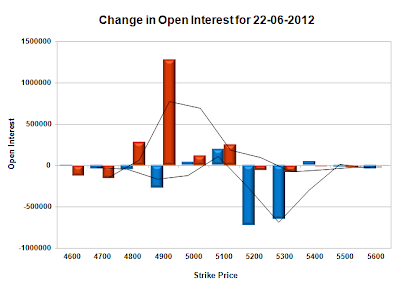 Resistance is right now placed at 5200, with OI of 38.5 lacs and above that at 5300 with highest OI of 44.8 lacs. 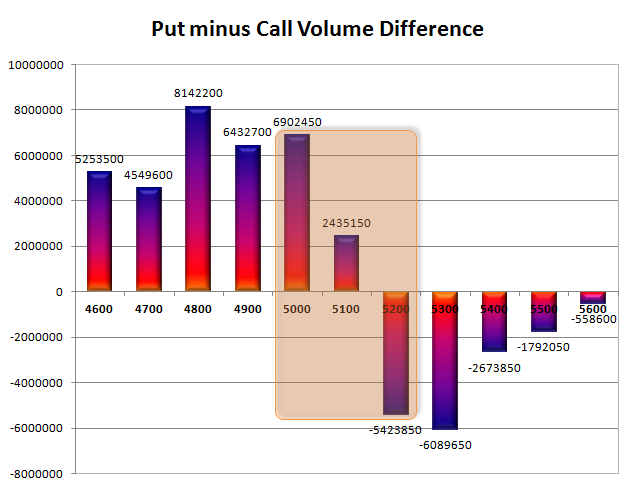 Range as per Option Table is 5090 -5201 and as per VIX is 5094 - 5205 with 5145 as the Pivot. Nifty consolidated for another day with positive bias but in a very narrow range of just 31 points. Good rollover was seen today with approx 23 lacs rolled within Nifty range of 5130-5155. The index ultimately closed the day at 5141.90, a gain of 21.10 points. The Option Table saw huge liquidation in most of the CE levels. Most of the Rollover and addition (78.9 lacs OI added) happened in July series in the range of 5096-5195. Call option 51000-4900 covered 17.3 lacs huge amount of OI, with profit booking seen at 5200 and above strike prices. Put Option 5100 added 3.82 lacs huge amount of OI, with huge liquidation seen at 5200 and above strike price. Highest accumulation on Call option 5200 at 79 lacs & 5300 at 63.9 lacs whereas Put option 4800 at 89.7 lacs & 5000 at 88.3 lacs. Nifty Open Interest is at 1,29,69,800 down by 22,61,350 with increase in price, whereas July series added 22.8 lacs OI, most probably 100% rollover with small long build-up. Bank Nifty Open Interest is at 14,53,500 down by 3,83,475 with increase in price, whereas July series added 3.46 lacs OI, most probably 90% rollover with some long liquidation. FII’s bought huge 12.21 lacs Futures (another biggie), most probably long build-up, their OI decreased by 2.7 lacs, and their average price per contract comes to around 5026. FII’s future open contract as on date is 6.77 lacs. PCR Open Interest (Volume) is at the highest of the series just before expiry at 1.993. Support for the day at 5100, with huge addition of 3.8 lacs, with total OI above 67.4 lacs, below that at 5000 with highest OI of 88.3 lacs. Super Resistance is right now placed at 5200, with highest OI of 79 lacs and above that at 5300 with huge OI of 63.9 lacs. 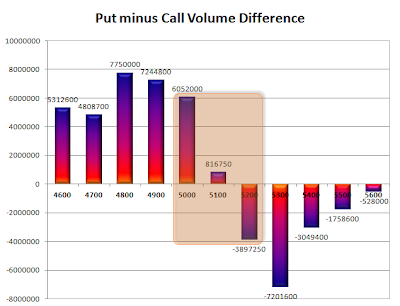 Range as per Option Table is 5085 -5200 and as per VIX is 5087 - 5197 with 5140 as the Pivot. Nifty consolidated throughout the day keeping the previous day’s close as Pivot and a 39 point range making a high of 5134.55 and low of 5095.50 and closing just positive at 5120.80, a smallish gain of 6.15 points. The bias for the better part of the day remained positive, but the sellers were seen around the top. The Option Table saw huge addition at 5100PE with 5000 - 5200 as the max range till expiry. 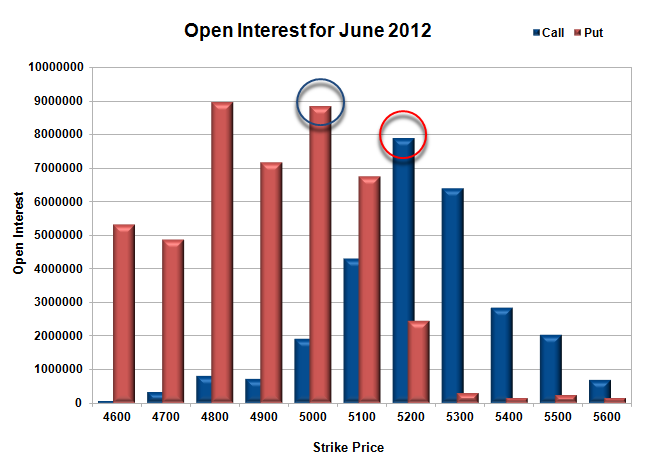 Call option 5000-5200 added 2.06 lacs huge amount of OI, with huge profit booking seen at 5300 and above strike prices. Put Option 5100-4800 added 13.1 lacs huge amount of OI, with huge liquidation seen at 5200 and above strike price. 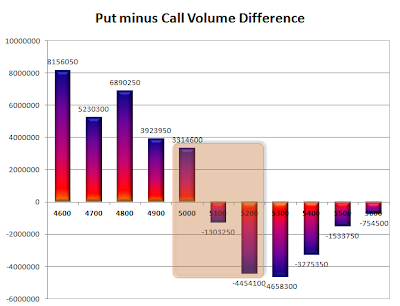 Highest accumulation on Call option 5200 at 83.5 lacs & 5300 at 68.9 lacs whereas Put option 4800 at 91.3 lacs & 5000 at 89.1 lacs. Nifty Open Interest is at 1,52,31,150 down by 20,01,200 with increase in price, whereas July series added 33.25 lacs OI, most probably 100% rollover with huge long build-up. Bank Nifty Open Interest is at 18,36,975 down by 2,59,500 with increase in price, whereas July series added 4.48 lacs OI, most probably 100% rollover with huge long build-up. FII’s bought huge 15.76 lacs Futures (one of the biggest in recent times), most probably long build-up, as their OI also increased by 28.18 lacs, and their average price per contract comes to around 5011. FII’s future open contract as on date is 6.83 lacs. PCR Open Interest (Volume) is at the highest of the series just 2 days before expiry at 1.862. Support for the day at 5100, with huge addition of 7.9 lacs, with total OI above 63.5 lacs, below that at 5000 with highest OI of 89.14 lacs. Super Resistance is right now placed at 5200, with highest OI of 83.5 lacs and above that at 5300 with huge OI of 68.9 lacs. Range as per Option Table is 5059 -5178 and as per VIX is 5067 - 5175 with 5130 as the Pivot. Nifty opened strong on anticipation of something big coming from the RBI and the FM, and went on to touch 5194, but the measures were below street expectations and the market gave a thumbs down with huge move down of 100 points from the top within the next hour of trade to end the day at the lows of 5114.65, a loss of 31.40 points and aligned with the weak global cues. The Option Table saw huge addition at 5200CE. Call option 5100-5300 added 15.3 lacs huge amount of OI, with huge liquidation seen at 5000 and below strike prices. Put Option 5200 added 3.65 lacs huge amount of OI, with profit booking seen at 5100 and below strike price. Highest accumulation on Call option 5200 at 82.4 lacs & 5300 at 77.4 lacs whereas Put option 4800 at 89.9 lacs & 5000 at 88.1 lacs. Nifty Open Interest is at 1,72,32,350 up by 3,52,900 with decrease in price, whereas July series added 22.8 lacs OI most probably huge short build-up. Bank Nifty Open Interest is at 23,71,950 down by 2,75,475 with decrease in price, whereas July series added 2.49 lacs, most 90% rollover with some long liquidation. FII’s sold huge 1.38 lacs Futures, most probably short build-up, as their OI also increased by 44.85 lacs, and their average price per contract comes to around 4987. FII’s future open contract as on date is 6.27 lacs. PCR Open Interest (Volume) is at 1.765, down from the highs of 1.816, due to huge addition at 5200CE. 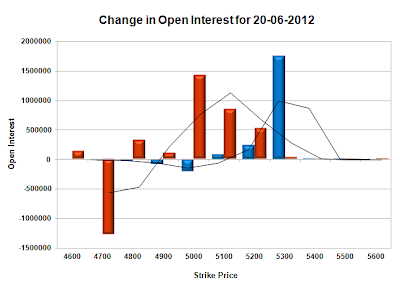 Support for the day is still placed at 5100, but now weakened, below that at 5000 with highest OI of 89.1 lacs. 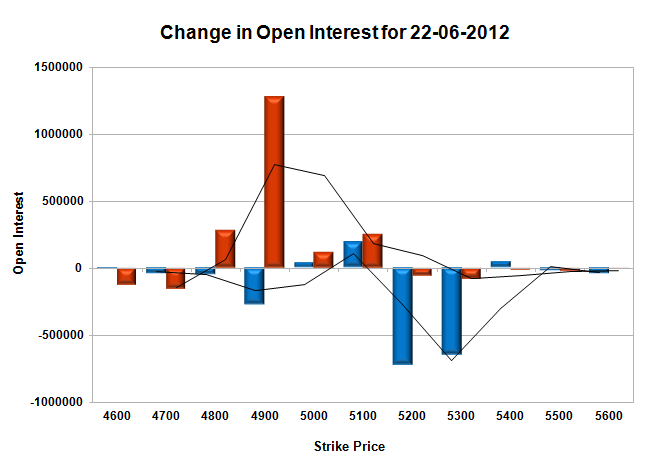 Resistance is right now placed at 5200, with highest OI of 82.4 lacs and above that at 5300 with huge OI of 77.4 lacs. Range as per Option Table is 5072 -5193 and as per VIX is 5057 - 5172 with 5130 as the Pivot. Nifty opened weak below the dotted lines on the back of very bad global cues and got sold off below 5100 level. The buyers got into the act and moved the index well above 5100 to around 5150 to ultimately close the day and week at 5146.05, a small loss of 18.95, but a weekly gain of 7 points. The Option Table saw huge liquidation at 5200 and 5300CE Level. 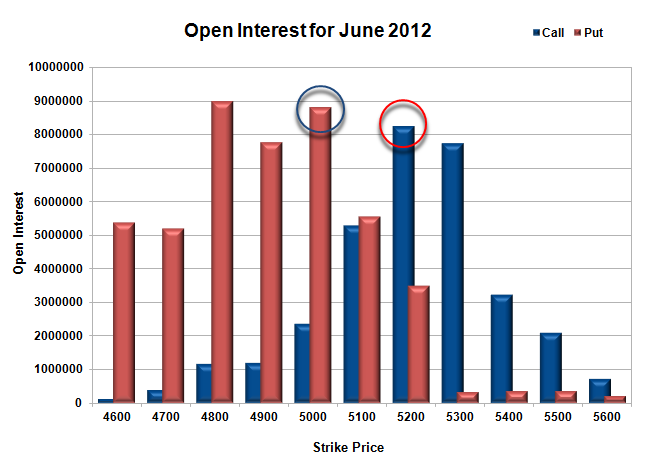 Call option 5000-5100 added 2.24 lacs huge amount of OI, with huge liquidation seen at 4900 and below strike prices. Put Option 5100-4800 added 19.2 lacs huge amount of OI, with profit booking seen at 4700 and below strike price. Highest accumulation on Call option 5300 at 76.1 lacs & 5200 at 70.5 lacs whereas Put option 4800 at 90.2 lacs & 5000 at 89.1 lacs. Nifty Open Interest is at 1,68,79,450 down by 4,71,950 with decrease in price, most probably long liquidation. Bank Nifty Open Interest is at 23,71,950 down by 1,636,250 with no change in price, most probably long liquidation. FII’s bought huge 2.59 lacs Futures, most probably long build-up, as their OI also increased by 11.45 lacs, and their average price per contract comes to around 5010. PCR Open Interest (Volume) is at 1.816, the high point of the series. 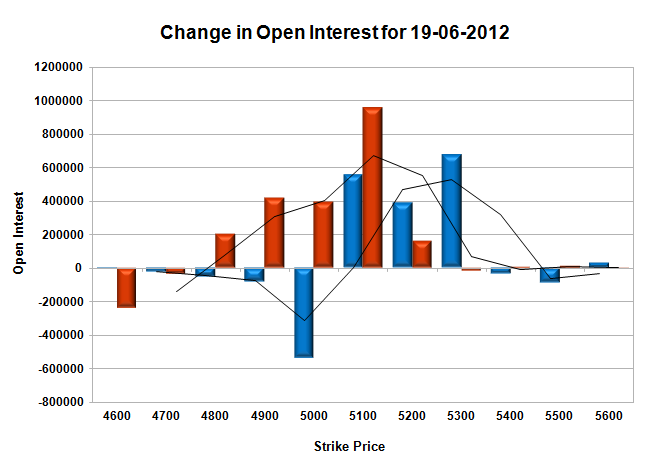 Support for the day is now placed at 5100 with OI of above 59.6 lacs, below that at 5000 with highest OI of 89.1 lacs. Resistance is right now placed at 5200, though covered 7.3 lacs but OI still above 70 lacs and above that at 5300 with highest OI of 76.1 lacs. Range as per Option Table is 5077 -5195 and as per VIX is 5091 - 5201 with 5140 as the Pivot. What started as a Dull Day in Nifty with a range of 20 points in the morning turned out to be a super day for the Bulls. The Index accelerated towards the highs of the day during the last 1 hour of trade to end at 5165.00 a handsome gain of 44.45 points. The Responsive buyers were in control of the market (Responsive Buying - occurs when Commercial/Longer Timeframe traders Buy the market below the Value Area Low rotating price back inside the Value Area.) and ended the day at monthly high. The Option Table saw huge addition at 5200PE and huge liquidation at 5100CE. Call option 5200-5300 added 5.4 lacs huge amount of OI, with huge liquidation seen at 5100 and below strike prices. Put Option 5200-5000 added 18.4 lacs huge amount of OI, with profit booking seen at 4800 and below strike price. 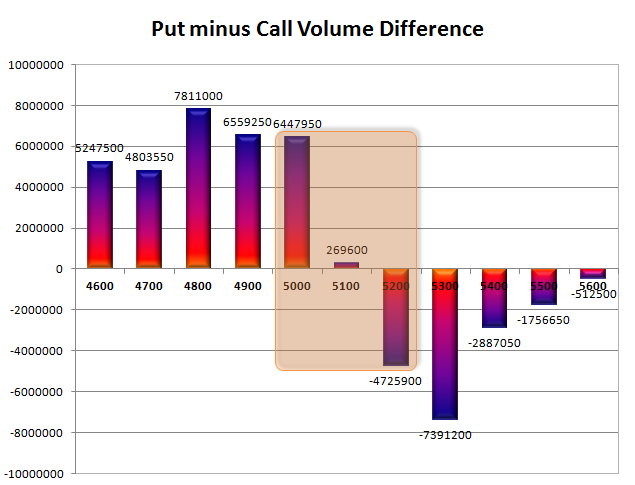 Highest accumulation on Call option 5300 at 82.6 lacs & 5200 at 77.8 lacs whereas Put option 5000 at 88 lacs & 4800 at 87.4 lacs. 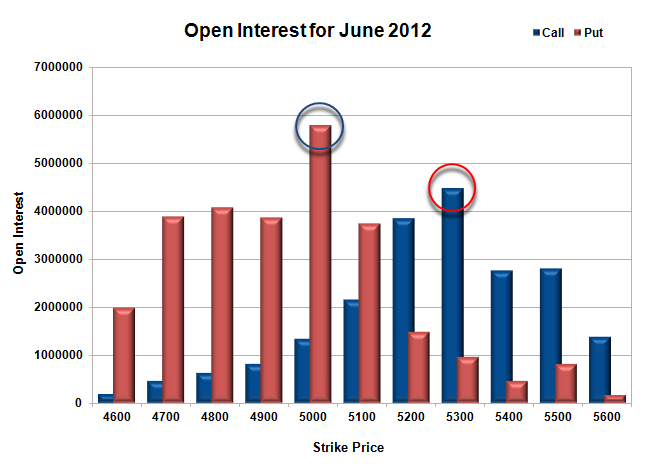 Nifty Open Interest is at 1,73,51,400 up by 8,07,150 with increase in price, most probably huge long build-up. Bank Nifty Open Interest is at 25,35,200 down by 6,275 with increase in price, most probably small short covering. FII’s bought huge 3.64 lacs Futures, most probably long build-up, as their OI also increased by 14.29 lacs, and their average price per contract comes to around 5014. FII’s future open contract as on date is 5.14 lacs. 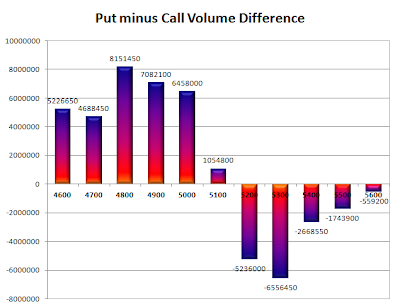 PCR Open Interest (Volume) is a back to 1.695 with huge liquidation at 5100CE. 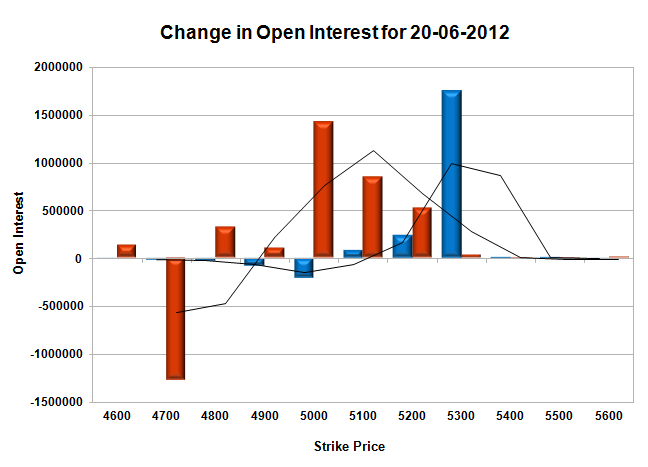 Support for the day is now placed at 5100 with OI of above 56.6 lacs, below that at 5000 with highest OI of 88 lacs. Resistance is right now placed at 5200, with OI of above 77.8 lacs and above that the wall of china at 5300 with highest OI of 82.6 lacs. 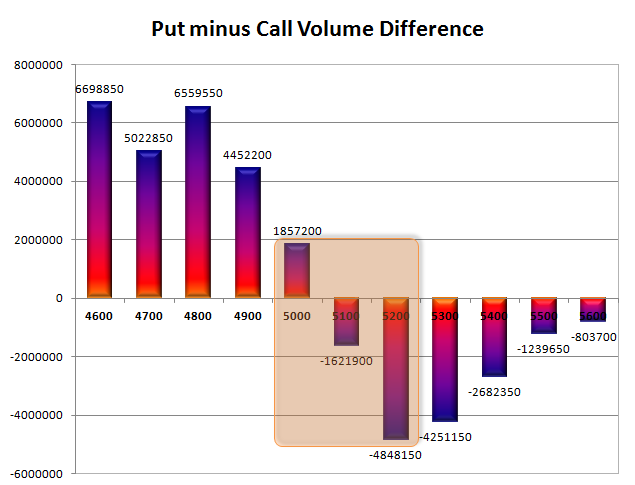 Range as per Option Table is 5088 -5207 and as per VIX is 5111 - 5219 with 5140 as the Pivot. Nifty opened above the dotted line, and remained range bound for the entire session within a range of 40 points with a high of 5141 and low of 5100. It seemed that market participants are waiting to for the all important Federal Reserve monetary policy decision and not ready to take undue position. The market closed at the middle of the range at 5120.55 with a smallish gain of 16.70 points, another positive day. The Option Table saw huge addition at 5300CE and 5000PE. 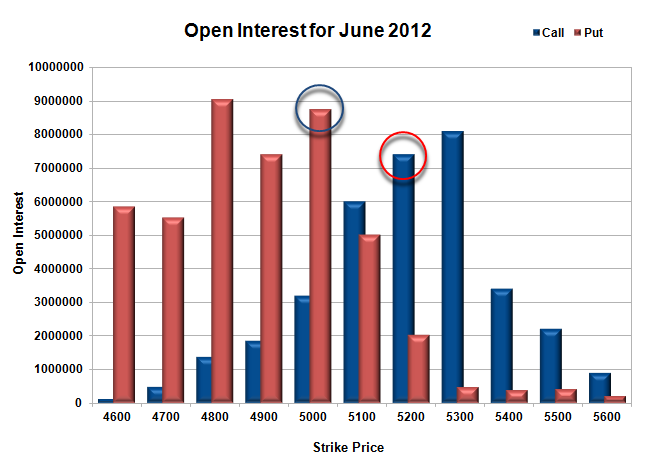 Call option 5100-5300 added 20.8 lacs huge amount of OI, with some liquidation seen at 5000 and below strike prices. Put Option 5200-4800 added 32.3 lacs huge amount of OI, with huge liquidation at 4700 strike price. 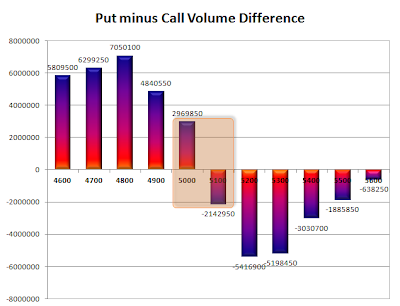 Highest accumulation on Call option 5300 at 80.8 lacs & 5200 at 74.2 lacs whereas Put option 4800 at 90.4 lacs & 5000 at 87.5 lacs. 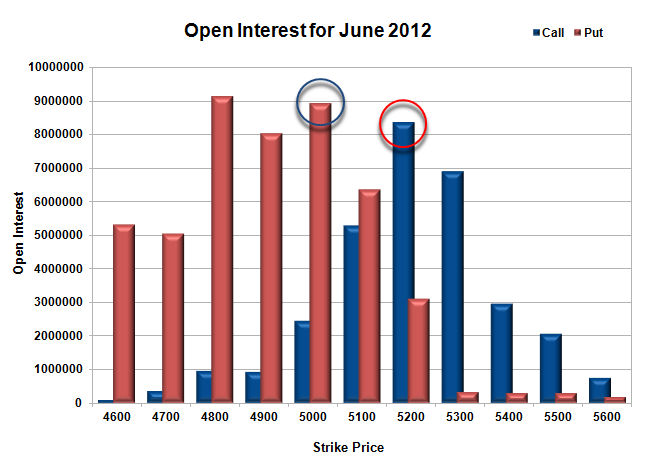 Nifty Open Interest is at 1,65,44,250 up by 1,58,800 with increase in price, most probably huge long build-up. Bank Nifty Open Interest is at 25,41,475 down by 5,700 with increase in price, most probably small short covering. FII’s bought huge 4.16 lacs Futures, most probably long build-up, as their OI also increased by 7.61 lacs, and their average price per contract comes to around 4972. FII’s future open contract as on date is 4.85 lacs. PCR Open Interest (Volume) is a bit down at 1.620 with huge liquidation at 4700PE. Super Support for the series is now placed at 5000 with OI of above 87.5 lacs, below that at 4900-4800 with huge OI of 74 and 90 lacs respectively. 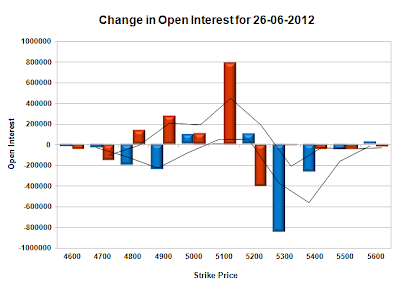 Resistance is right now placed at 5200, with OI of above 74 lacs and above that at 5300 with highest OI of 80.8 lacs. Range as per Option Table is 5059 -5181 and as per VIX is 5064 - 5177 with 5110 as the Pivot. Nifty opened above the dotted line, but immediately made a dash towards the low of the day around 5050. The responsive buyers moved in and what followed was a roller coaster ride with Nifty oscillating between 5060 and 5110, ending at the highs of the day at 5103.85, a cool gain of 39.60 points, much better than the Bearish outlook presented yesterday after RBI no show and Fitch downgrade. The Option Table saw huge addition at 5100PE. 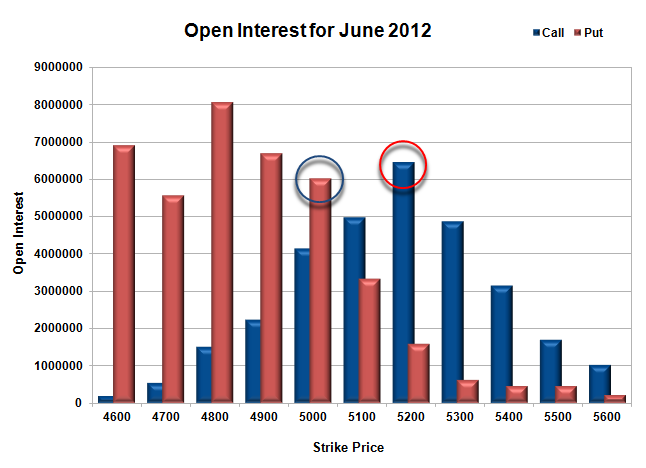 Call option 5100-5300 added 16.2 lacs huge amount of OI, with some liquidation seen at 5000 and below strike prices. Put Option 5200-4800 added 21.3 lacs huge amount of OI, with huge liquidation at 4600 strike price. 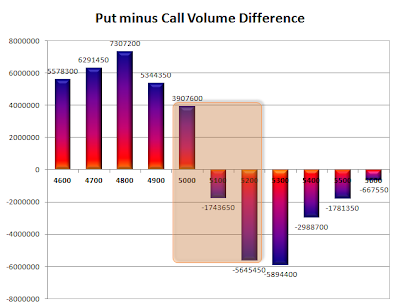 Highest accumulation on Call option 5200 at 71.7 lacs & 5300 at 63.4 lacs whereas Put option 4800 at 87.2 lacs & 5000 at 73.3 lacs. 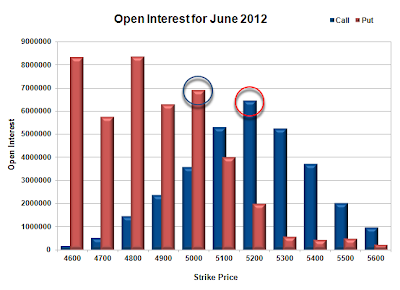 Nifty Open Interest is at 1,63,85,450 down by 1,18,900 with increase in price, most probably huge short covering. 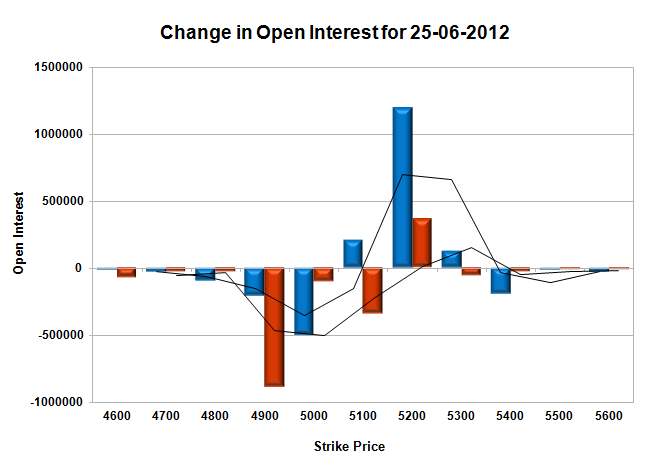 Bank Nifty Open Interest is at 25,47,175 down by 4,650 with increase in price, most probably small short covering. FII’s sold huge 4.27 lacs Futures, most probably short build-up, as their OI also increased by 9.2 lacs, and their average price per contract comes to around 4966. FII’s future open contract as on date is 4.7 lacs. PCR Open Interest (Volume) is still around yesterday’s level of 1.679. 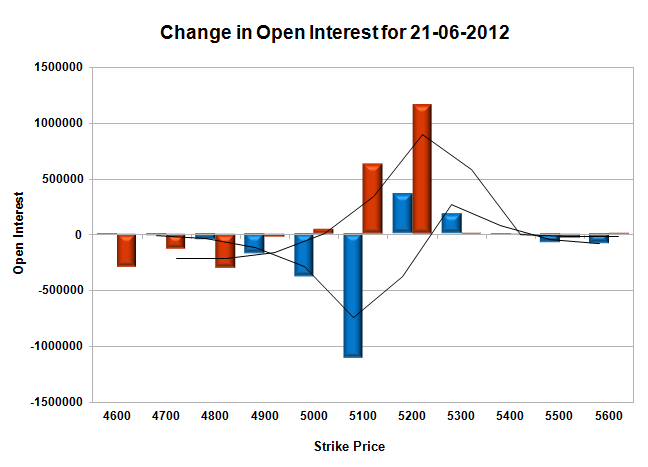 Support for the day at 5000 with OI of above 73 lacs, below that at 4900 with huge OI of 72.8 lacs. 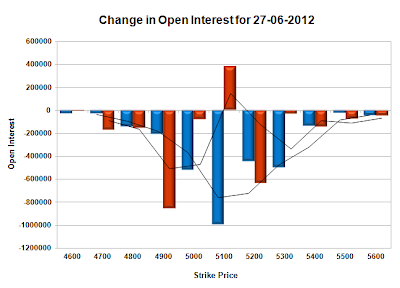 Resistance is right now placed at 5200, with highest OI of 71.7 lacs and above that at 5300 with OI above 63.4 lacs. 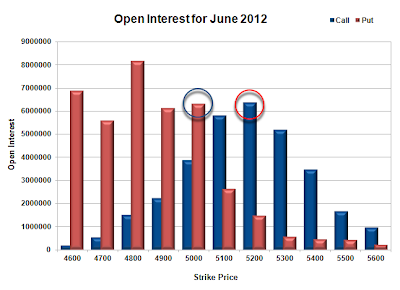 Range as per Option Table is 5029 -5153 and as per VIX is 5047 - 5161 with 5100 as the Pivot. Nifty followed up from where it left on Friday to hit a high of 5190, but it got a huge shock in the form of RBI governor not tinkering with the rates as per street expectation. The index nose-dived more than 100 points within a few minutes after the announcement and went below 5050, just to close above at 5064.25, a huge loss of 74.80 points. The Option Table saw huge addition at 5200-5300CE levels and 4900PE. 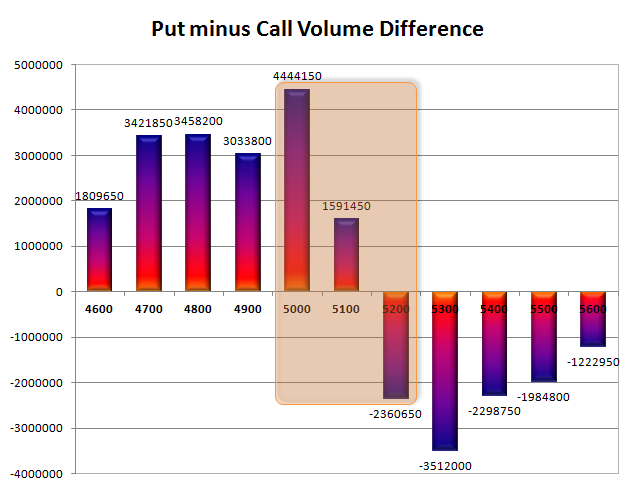 Call option 5000-5300 added 11.9 lacs huge amount of OI, with some liquidation seen at 4900 and below strike prices. Put Option 5000-4700 added 18.3 lacs huge amount of OI, with huge liquidation at 4600 and 5100 and above strike prices. Highest accumulation on Call option 5200 at 67.8 lacs & 5300 at 56.6 lacs whereas Put option 4800 at 85.2 lacs & 5000 at 69.3 lacs. 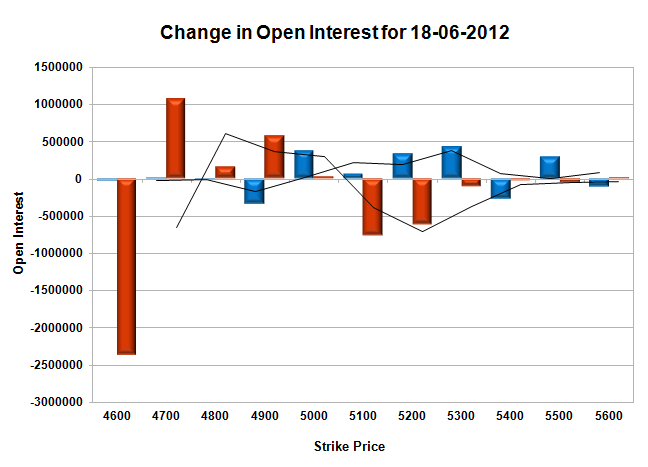 Nifty Open Interest is at 1,65,04,350 up by 1,65,600 with huge decrease in price, most probably huge short build-up. 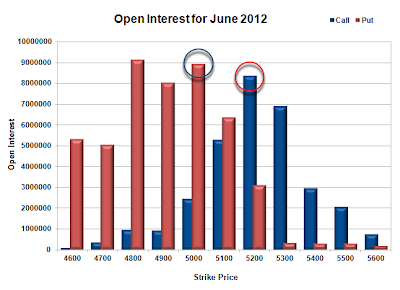 Bank Nifty Open Interest is at 25,51,825 up by 1,07,875 with huge decrease in price, most probably huge short build-up. FII’s bought huge 3.3 lacs Futures, most probably long build-up, as their OI also increased by 16.4 lacs, and their average price per contract comes to around 4935. FII’s future open contract as on date is 4.52 lacs. PCR Open Interest (Volume) has gone down a bit to 1.672 with huge liquidation at 4600PE. 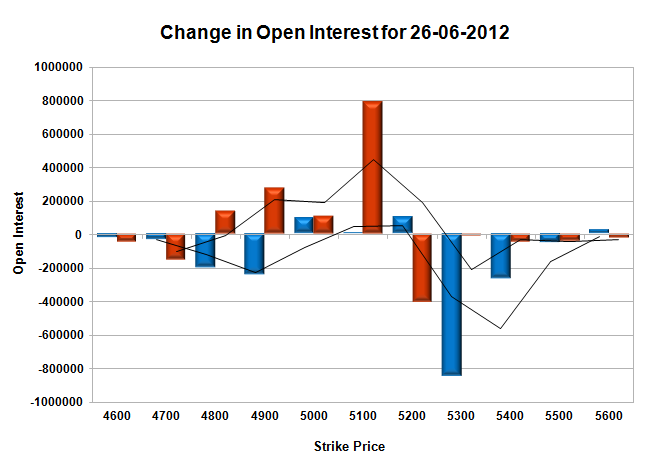 Support for the day at 5000 with OI of above 69 lacs, below that at 4900 with huge OI of above 68 lacs. Resistance is right now placed at 5100, with OI of 53.7 lacs and above that at 5200 with highest OI above 67.8 lacs. Range as per Option Table is 5029 -5152 and as per VIX is 5004 - 5124 with 5080 as the Pivot. It was a good day for the Bulls with the Nifty opening above the previous day’s close and the momentum being carried on till the end of day. The Index closed at the highs of the day at 5139.05 a huge gain of 84.30 points, in anticipation of good result from Greece and rate cut from the RBI governor on Monday. The Option Table saw huge addition at 5000-5200PE levels and now 5000 looks like a super support for the series. Call option 5200-5500 added 7.1 lacs huge amount of OI, with some liquidation seen at 5100 and below strike prices. 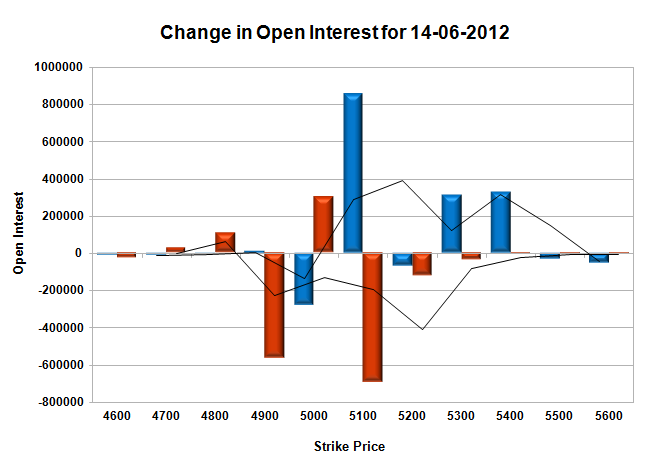 Put Option 5200-4600 added 44.4 lacs huge amount of OI, with not much change in other strike prices. Highest accumulation on Call option 5200 at 64.5 lacs & 5300 at 52.4 lacs whereas Put option 4800 at 83.6 lacs & 5000 at 69 lacs. 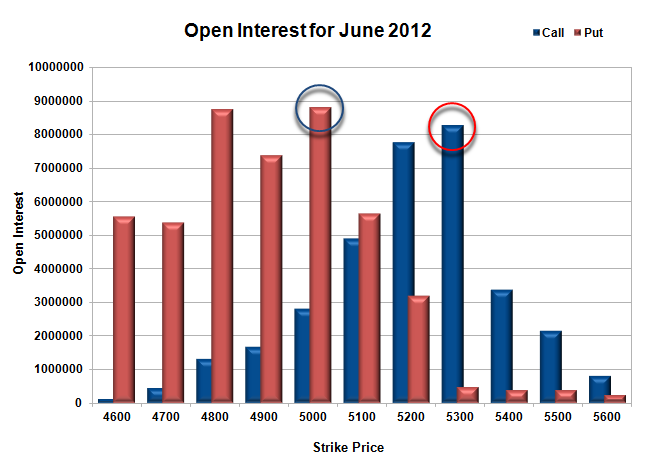 Nifty Open Interest is at 1,63,38,750 up by 7,49,250 with huge increase in price, most probably huge long build-up. 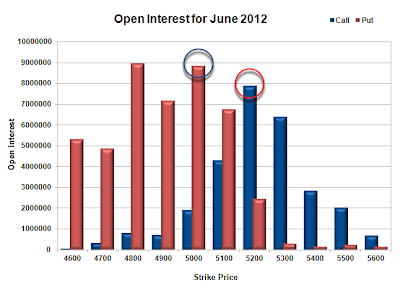 Bank Nifty Open Interest is at 24,43,950 up by 65,025 with huge increase in price, most probably huge long build-up. FII’s bought huge 4.28 lacs Futures, most probably long build-up, as their OI also increased by 12.30 lacs, and their average price per contract comes to around 5026. FII’s future open contract as on date is 4.19 lacs. 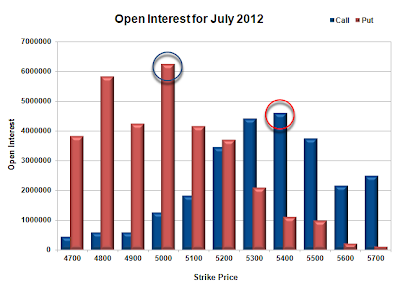 PCR Open Interest (Volume) has jumped to 1.768 with huge addition at 5100PE. 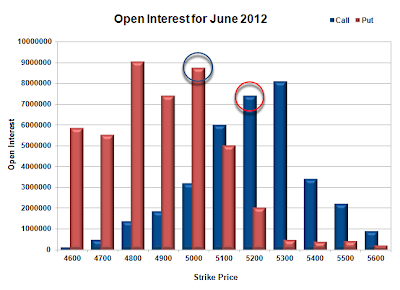 Support for the day at 5100 with huge addition of 13.6 lacs, below that at 500 with huge OI of above 69 lacs. Resistance is right now placed at 5200, with highest OI of 64.5 lacs and above that at 5300 with OI above 52 lacs. 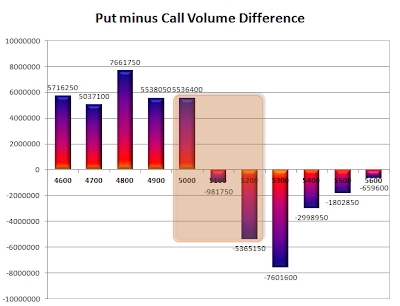 Range as per Option Table is 5062 -5182 and as per VIX is 5070 - 5208 with 5110 as the Pivot. Today it was Inflation which did the Nifty in. The Index opened flat to negative and was quiet till Inflation data came in at 7.55% against 7.23% in previous month. The rising inflation diminished hopes of monetary easing and market participant went on long liquidation spree, which saw Nifty end at the lows of day at 5054.75, a huge loss of 66.70 points. Option Table saw huge addition at 5100CE to the tune of 8.54 lacs. Call option 5100, 5300-5400 added 14.9 lacs, with some profit booking seen at 5200 strike price. 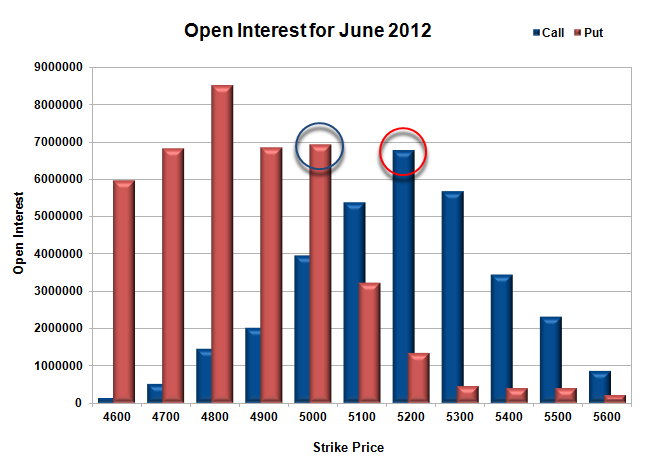 Put Option 5000 added 3.04 lacs huge amount of OI, with huge liquidation seen at 5100 and above strike prices. 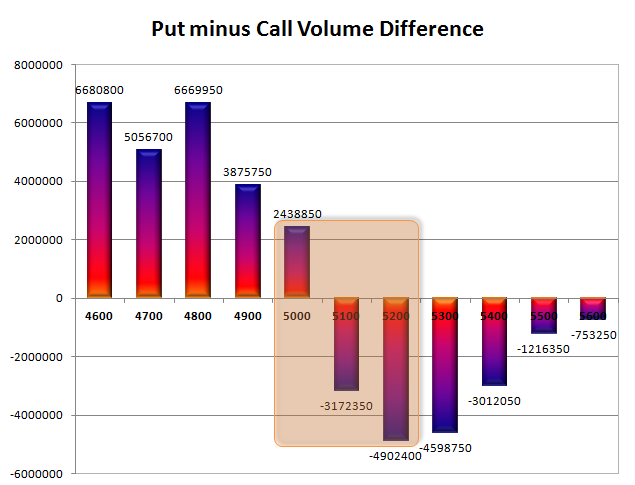 Highest accumulation on Call option 5200 at 63.8 lacs & 5100 at 58.2 lacs whereas Put option 4800 at 81.8 lacs & 5000 at 63.2 lacs. Nifty Open Interest is at 1,55,89,500 down by 5,99,300 with huge decrease in price, most probably huge long liquidation. Bank Nifty Open Interest is at 23,78,925 down by 66,375 with huge decrease in price, most probably huge long liquidation. PCR Open Interest (Volume) has gone down for the day but still comfortably placed at 1.647. 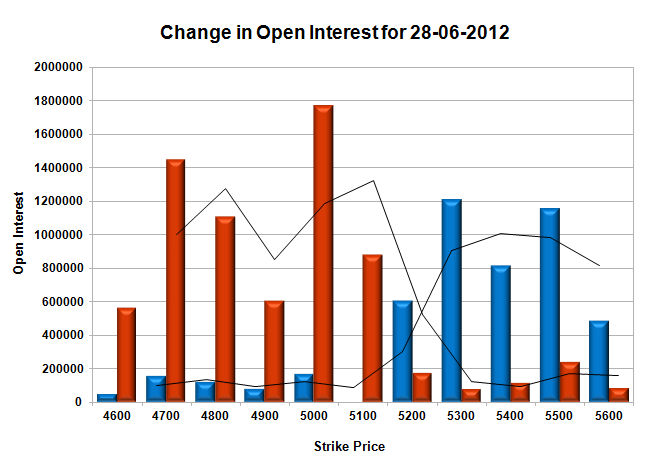 Support for the day at 5000 with huge addition of 3.03 lacs, below that at 4900-4800 with OI of above 60 lacs. Resistance got build-up at 5100, with huge addition of 8.5 lacs and above that at 5200 with highest OI of 63.8 lacs. 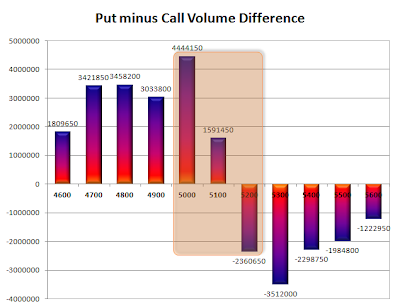 Range as per Option Table is 5013 -5130 and as per VIX is 4987 - 5123 with 5080 as the Pivot. Today was a perfect consolidation day for Nifty, with the index oscillating around the previous day’s close with not much conviction by either the Bulls or the Bears. The index ultimately closed flat at 5121.45, a miniscule gain of just 5.55 points. It seems that the market participants are waiting for the Inflation data tomorrow to take position. On the Option front huge build-up was seen at 5100PE and 5200CE levels. 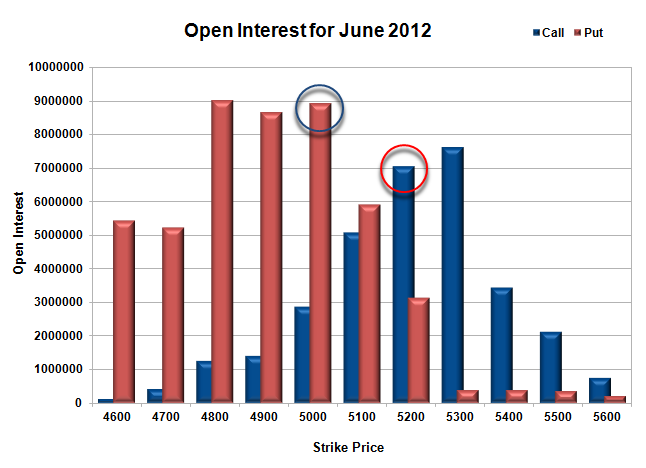 Call option 5200-5600 added 8.2 lacs huge amount of OI, with huge liquidation seen at 4900 and lower strike prices. 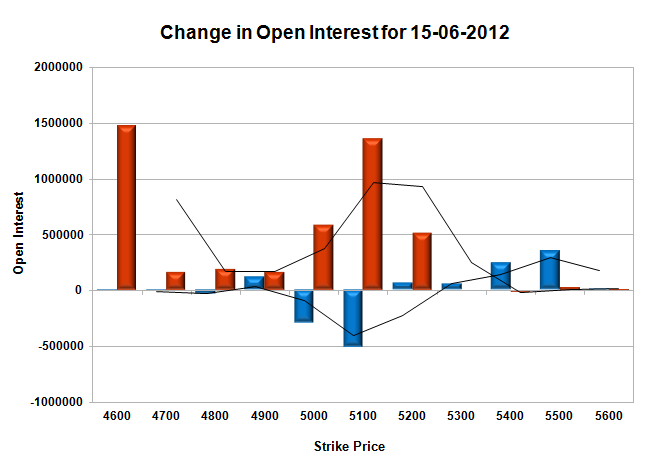 Put Option 5100-4600 added 17.3 lacs huge amount of OI, with not much change in other strike prices. Highest accumulation on Call option 5200 at 646.5 lacs & 5100 at 49.6 lacs whereas Put option 4800 at 80.7 lacs & 4900 at 66.8 lacs. 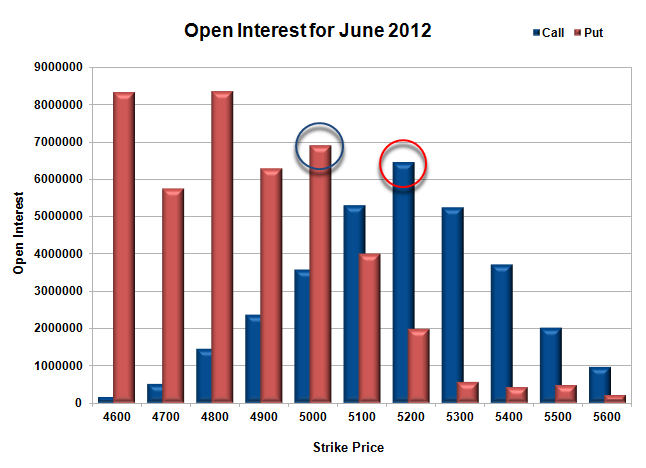 Nifty Open Interest is at 1,61,88,500 up by 4,51,300 with small increase in price, most probably huge long build-up. 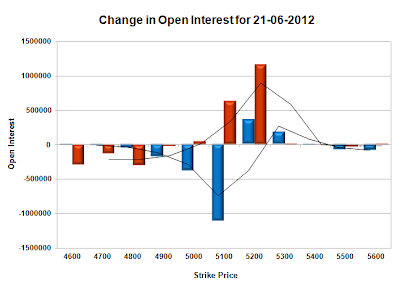 Bank Nifty Open Interest is at 24,45,300 down by 22,775 with decrease in price, most probably long liquidation. FII’s bought huge 21.8 lacs Futures, most probably long build-up and some short covering, as their OI also increased by 13.00 lacs, and their average price per contract comes to around 5018. FII’s future open contract as on date is 3.97 lacs. PCR Open Interest (Volume) is now at the highest of the series at 1.725. 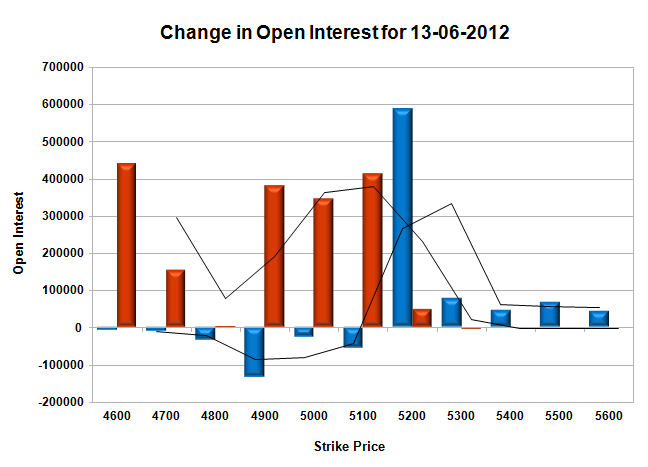 Support for the day at 5100 with huge addition of 4.1 lacs, below that at 5000 with OI of above 60 lacs. 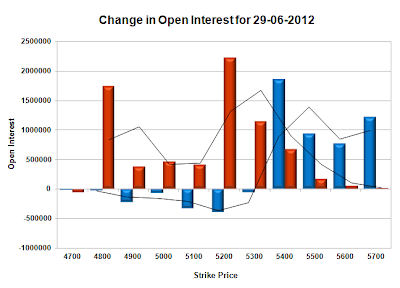 Resistance is right now at 5200 with highest OI of 64.5 lacs, and above that at 5300 with OI of around 48.8 lacs. Range as per Option Table is 5059 -5180 and as per VIX is 5056 - 5187 with 5110 as the Pivot.